There's an old post of mine that's maintained a steady trickle of traffic since I wrote it back in July of 2006. It's the one where I shared Jimmy Nelson's Instant Ventriloquism, a mail order record from 1964. My original upload lacked the script that came with the record. The missing document covered a conversation between you, the aspiring ventriloquist, and Farfel the dog. Thanks to the generosity of Dan Rodden this exchange is no longer a mystery. Additionally, he passed along some tracks with improved audio quality. and you'll be on your way to a satisfying dialog with a prerecorded dog puppet! My cousin had this record and I coveted it in my youth! 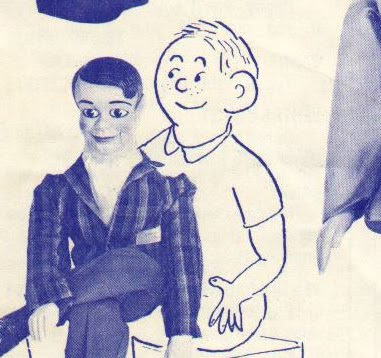 You see, I was an aspiring ventriloquist myself. I ordered the "ventril-o-aid" (a popsicle stick with holes drilled into it) and an Edgar Bergen Ventriloquism book from the J-S catalog. I'm certain if I would have had this record, my ventriloquism ambitions would have come to fruition. Thanks for sharing this!! I may dust off my Charlie McCarthy and quit my day job!